How do you fit yourself? Fitting another person is hard enough but doing it on yourself while looking in the mirror and getting stabbed by pins is impossible. One of the hallmarks of couture level sewing is perfect fit, so what to do? 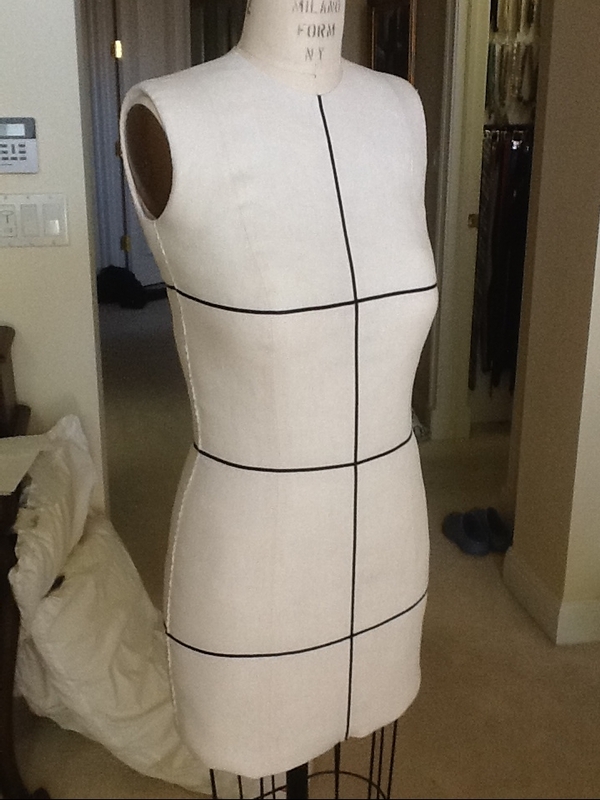 I decided to take a lesson from the couture houses and pad a dress form to duplicate my exact shape. There are countless sites about making duct tape copies of yourself but most finished results I saw were not what I had in mind. A professional dress form is HEAVY and stable. I had messed around some years ago with the adjustable ones with dials, but they too are lightweight and tip over easily. A custom made form is VERY expensive and not what I had in mind either. I was lucky enough to find a bridal shop closing its doors and bought a couple of their forms. If you decide to give this a try, get a size that fits your shoulders and body ABOVE the bust. I found that if the form is the correct size at the full bust it is usually much too large through the neck and shoulders. You can pad the form but you can’t cut it down. I usually sew a size 8 and found the size 2 form fit me at the upper body best. My back waist length is 2 inches longer, waist and hips larger but those changes are easy to do with padding. Now I needed a guide as to where and how much to pad. I signed up for the Craftsy class, Patternmaking Basics: The Bodice Sloper with Suzy Furrer. This is definitely not a beginner class and does take a fair amount of time to work through, but her instructions of drafting a moulage were easy to follow and produced amazing results. Here is my completed draft. The toughest part of this was measuring the body correctly. Next Suzy walks you through cutting out this draft into a skin tight moulage. Since I was fitting myself, I left the opening down the center front rather than the back. I can barely breathe and it looks a little wrinkled because I’m holding the camera but it does fit like a glove when I’m standing still. 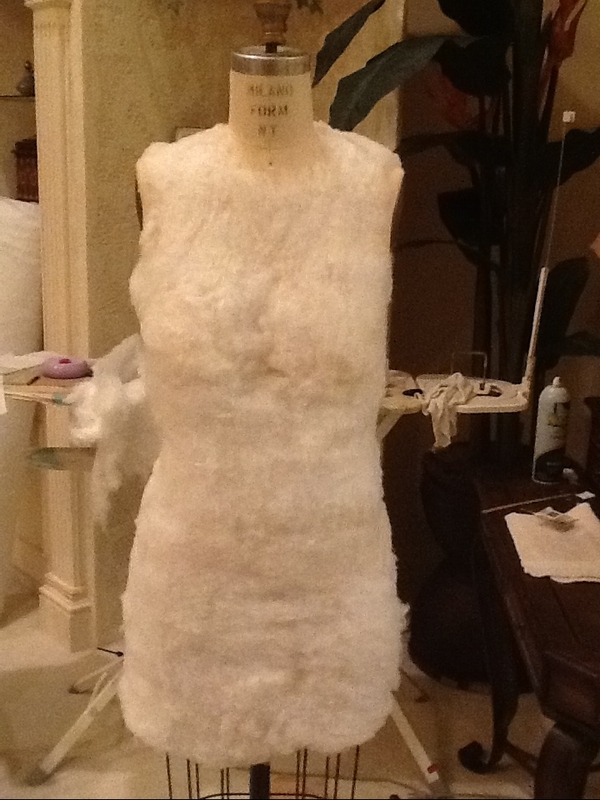 I tried the moulage on my dress form and noted where and about how much to pad. I used non-bonded upholstery padding which tears very easily and allows you to feather out the edges. I also found it helpful to cut the cups out of an old bra and pin them in place to help shape the bust. Here is my girl with bra cups in place and partially padded. More padding until the moulage is filled out. This will take several tries but just keep shaping until the moulage is filled but not bursting. 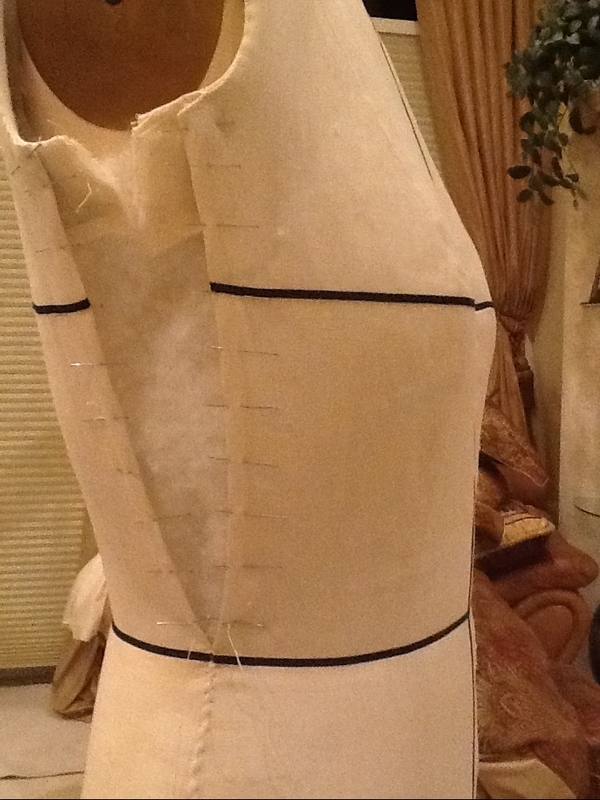 For my form cover I made another moulage from linen and added neck and armhole facings. I left the side seams of the linen cover open. The upholstery batting sticks to itself and the cover so it’s impossible to get it on smoothly if you leave just the back or front open. It also sews together better at the side seams. Pin both side seams closed before starting to hand sew the side seams. I marked the seams every inch and used these marks to help keep the cover aligned while whipstitching closed. My completed clone. I added tape to the center front, back, waist, hip and bust lines. Notice the different armhole angle on me versus the form. No wonder things didn’t fit. Constructing this required several sessions of work but I’m very happy with the results. Imagine having a clone of yourself that stands still for hours of fitting and doesn’t mind pins. Please comment if you have questions or need sources. What a professional finish! It’s as perfect as ones I saw at a bespoke tailor in London. Thanks. It did take considerable time and a couple of redos until I got it right. I hope others are inspired to give it a try. You can do it! Thank you so much for this post. I have tried to pad my adjustable form several times but the result is never satisfactory – as you say, measuring yourself is a huge problem. I have had so many sewing failures due to fit, that I am quite desperate. I will look for a second hand commercial dress form and if successful, try again. I have Kenneth D King’s cd on how to create your own moulage (again taking own measurements is the problem) but I will give it another go. I love sewing! Thank you again for posting such wonderful information. I really appreciate it. Glad you enjoyed this. I too made previous attempts and none were as successful as this. It does take some time, patience and maybe making a couple of moulages until you get it perfect but I feel having an exact mold of myself will save so much time in the long run. I understand both Suzy and Kenneth use much the same method so I’m sure you’ll get great results with Kenneth’s CD. Good luck in locating a form. Some of the ones on EBay are way overpriced and I found mine on Craig’s List. I also purchased another which had a very worn cover but the base was solid and the cover didn’t matter since I was replacing it. Other tips are to put a bra that fits you well on her; that makes shaping the bust much easier. Stuff the cups so they hold their shape. Also the non-bonded batting made such a difference. I had used regular quilt batting in previous attempts and found it impossible to tear and cutting it left distinct lines. It was impossible to feather out the edges. Check out commercial upholstery suppliers for a source. Good luck and I would love to hear how you do. Great job!.. looks so neat!…I used to work in a costume shop where we had to pad out forms quickly for many different shapes.. I found sculpted pads from fabulous fit & using the right size bra & quilt batting..then would cover with old oversized men’s white cotton t shirt..cutting out neck band & armholes…then used 3/8″ fur tape to mark cf ..bust ..waist ..hips etc…we also had a great measurement chart..that we instructed actors to have some one else measure them..there were about 25 different measurements so we could tell if something was off! Thanks. Shoulder pads also work well; you can layer them and the edges are thin. You’re right about puttingg the correct size bra on the form; I found that to be a big help. Great suggestions for making it a little quicker. Thank you for the great tips!! I am just returning to garment sewing, after spending many years quilting, and fitting myself is almost impossible….my husband has tried to help, but he has a hard time staying serious and it ends up more like a SNL skit:) I will try the resources you mentioned as I live in a beautiful, but remote, area so everything will have to be shipped. How do I know what the shoulder and above bust measurements of prospective dress forms are? Do the sellers share that or answer questions? Thank you again for your timely post. You can ask the seller to measure but I’ve found most of them non-sewers who are totally confused when you ask for a “high bust measurment.” I will post a size chart which most of the major form companies adhere to. Error on the side of too small; you can always pad out but taking away inches is impossible. I needed to add slightly to my cross back measurment which meant I needed to build up the armhole in the back which I can give you additional instructions if needed. Let me know if you need an upholstery batting supplier as they can be hard to find. Fortunately with the internet, things are much more available now than in the past. I sympathize with your experiences trying to enlist your husband’s help. Mine is a surgeon and you would think that would be an asset, but he’s totally incompetent when it comes to helping with measuring and fitting. Thanks so much for the upholstery batting source! A few more questions: what did you use for the black tape and how did you attach it; and how thick was the linen that you used for your final moulage? It seems to really smooth out the final form and the batting doesn’t bump up underneath. Thanks again! The tape is 1/8 inch grosgrain ribbon. JoAnn’s has it on small reels. I cut fusible web 1/8 inch wide, fused and then stitched with a double needle. If you don’t fuse first the tape has a tendency to shift while sewing. I used a medium weight linen, not handkerchief and not the heavy weight. I got it at Mood in NYC and can get you ordering info if you need. Don’t pre shrink or use too much steam on the linen when constructing the moulage. After your form is stuffed and side seams sewn then steam heavily which will shrink and tighten up the form. Feather out the edges of the batting which will prevent lumps and bumps. The unbonded batting can be feathered out at the edges unlike the bonded variety. Hope all this info helps. Please comment if you have more questions. Where can I see your finished result? Thank you – you’ve been very generous and kind. I’ve been through so many versions of a dress form that were disappointing, but I am so excited about this option and everything I will learn in the process! I’m also learning a lot from your blog in general. I don’t have a website, but I will figure out a way to post my results. Thanks! I’m delighted to hear you find my blog helpful and hope the future posts will be equally as useful. I often search for instructions and find limited info. That leads to hours of research, testing and maybe results that are helpful to others. Thanks. Mary, where did you get the batting? I have been to commercial upholstery suppliers asking for nonbonded batting and I am getting nowhere. Try garysupholstery.com. Click on products, then supplies, and then cotton batting. It is about $4.99 per yard. Two yards should be plenty; one might do it but I would get two just to be safe. Let me know if you still have difficulty. Good luck and I would love to see your results. Thanks, I dropped them an email. I made a “My Twin” custom form. 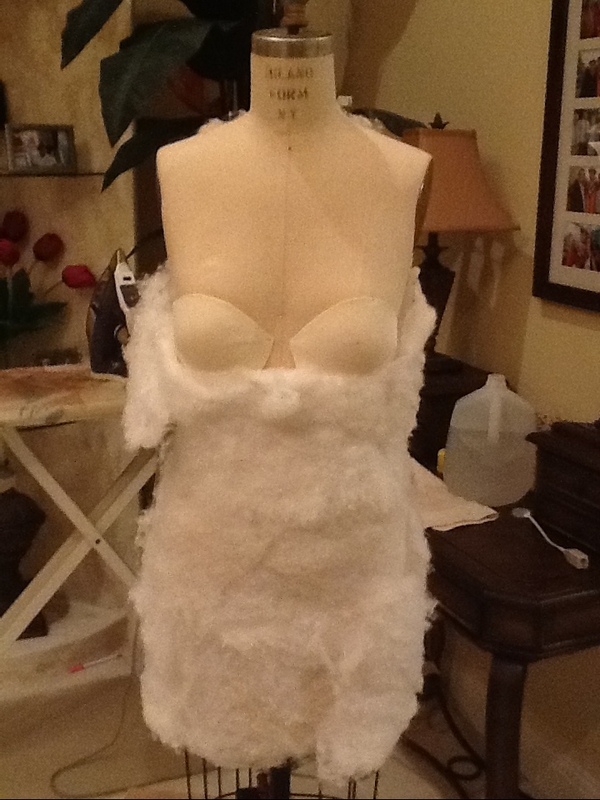 The plaster bandage cast collapsed in the skirt area while drying the dress form. The pant form was more successful. I’ll make good use of the batting! I’ve read many versions of making a form from duct tape, paper tape, plaster cast tape and they seemed like the result would be too lightweight and unstable for real dressmaking use. I think better use of time and money would be to invest in a real form; they aren’t too expensive now. Used ones are great as long you are smaller than the form. I got two at a going out of business bridal shop. Happy my info was useful. I think the finished form is fantastic, and very professional in it’s appearance. I’ve watched this same Craftsy class and found it helpful, although your tips for adapting this technique when you only have yourself for help (eg leave CF seam open) is extremely user. Glad you found it helpful. Making a form custom fit to my shape took some time but so worth it. I use her constantly and it’s so nice to be able to drape and sew, knowing the garment will really fit me. Thanks. I took a look at your site and my custom form doesn’t have the shape and definition you need for bras. Probably something like Beverly Johnson uses would work better. I have watched her bra making class but haven’t tackled custom bras yet. 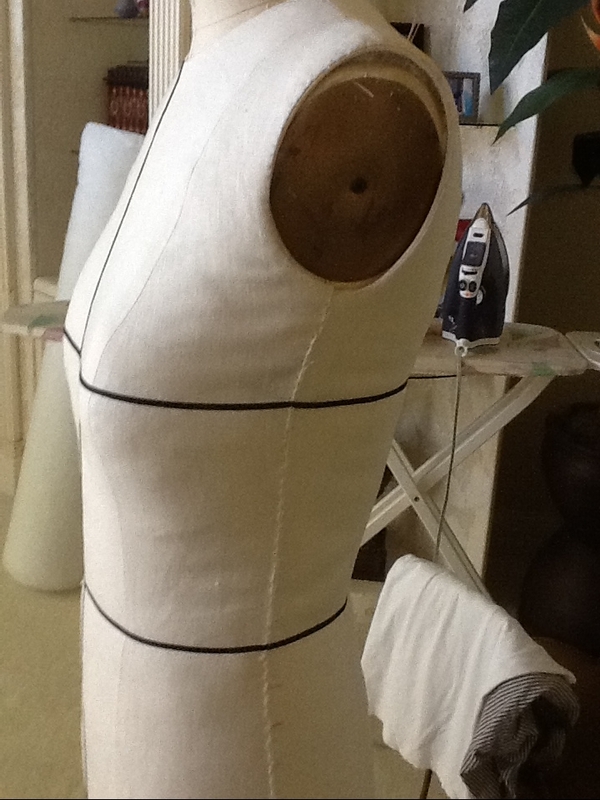 I am trying to finish my dressform moulage and I need to order the Medium weight Linen….you stated you ordered yours from Mood fabrics….but I just looked and they have lots of different medium weight Linen fabrics…. Can you please tell me exactly which one you ordered? This post was written a couple of years ago so I’m sure the exact fabric I used is no longer available. I took a quick look at Mood’s site and fabric # 310062 or anything similar would work. A medium weight cotton muslin is also great and less expensive than linen. The higher end professional forms such as Wolf use linen as the cover and I happened to have some. Linen is very durable but cotton muslin will be fine. I’m working on an updated post for custom form construction with arms. Thanks so much for your interest. Thank you for your reply. One more question, in the picture it looks like you backed the linen fabric with some type of interfacing or padding…not sure what…but the picture of you sewing up the side seam on the dress form looks like there is more than just Linen Fabric that you are sewing up (the Linen Fabric looks quite thick to me)…. Please let me know as soon as possible if you backed the Linen fabric with anything to make it thicker. No the outer fabric isn’t backed with anything. Good luck with your form. I’m always happy to answer questions. Thank you for referencing my method for creating a custom sized dress form. You will find Suzy’s class extremely helpful. She has published a book which explains her system and expands on pattern drafting. The Craftsy course does make it easier to follow the steps when drafting a moulage. Suzy uses the moulage to draft custom patterns but I thought it would be a fabulous way to produce a dress form custom sized to your body. I’ve found it so helpful. There seems to be considerable interest in this topic so I’m planning an in depth post to two with additional details and more modifications. I’m following your blog and am excited to have another sewer join the blogging community. Hello Mary, thank you for linking back to your 4/14 post.I really found it to be useful. Have a question – your shoulder appears to be narrower than that of the dress form. If that’s the case, how do you get the narrower shoulder when draping? I have no experience with draping, only flat patterns, but want to go there! Thanks very much for your help. I took a look at the photos and it may be an optical illusion and just the angle of the camera but the dress form shoulders are the same width as mine. 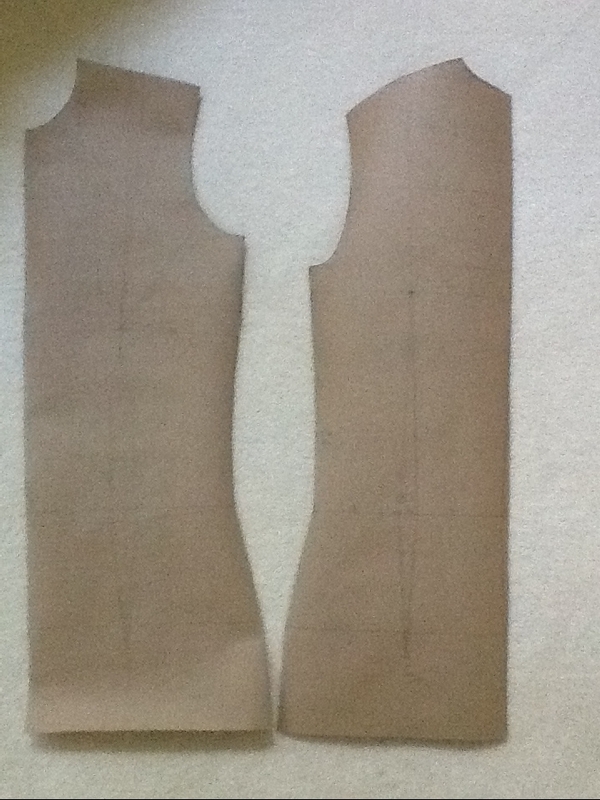 It would be impossible to make the shoulders narrower so be sure the dress form you start with isn’t larger. Enjoy your journey into draping. You gave me advice back around the first of the year to make a moulage and use it to pad my dress form to address many of my firing issues head on. I decided to give it a try and have taken several of Suzy Furrer’s classes and have her book. What terrific advice! It’s been a huge investment in time but I feel it’a going to be well worth it in the long run. I read in one of your posts a suggested product number for a mid-weight linen from Mood for the form’s cover. I can’t locate that post / product number now. Could you please send it if it’s handy? I’m anxious to get this done and then proceed to making the arm for the form. Thanks so much. You are really talented and your blog makes me want to sew all the time! If only I could …. Thanks for letting me know how much this helped. I agree that following Suzy’s methods take time but the perfection in fit will be well worth it. Mood’s stock changes rapidly and I don’t know the exact fabric I used. Linen is nice and the professional dress forms use linen but a medium weight muslin is fine. I’ve also used cotton drill cloth from JoAnns. The cotton muslin JoAnns sells is a little too thin and will have too much “give” when you start to stuff your form. Mood does sell medium weight linen, the stock number is 310675 for the oatmeal color. It’s 57/58 inches wide and $15.99/yard. Good luck and let me know how you fare. Thank you. I’ll get this ordered in the next day or so. Thank you for this wonderful post! I just finished Suzy’s class and thought what a great idea to pad my dress form now that I have a body double, which is what brought me to your blog. I have the Fabulous Fit system and find it is a little rough around the edges but I was able to get my form pretty close. I think I will do this again only use upholstery batting next time. I’m still considered a beginner by comparison to others, and I found Suzy’s classes are so straight forward, you can’t go wrong, especially since you can rewind over and over again to make sure your calculations are accurate. Suzy is very prompt with her feedback on questions and moulage critiques. I highly recommend it to anyone, even a beginner like me had no trouble with it! Thanks for letting me know you enjoy the blog. I have also used the Fabolous Fit pads but prefer the upholstery batting. I find the foam difficult to pin into and the batting is easier to feather the edges. Once you do the work and get a master draft, creating master patterns is easily done. I’m sure you will find your custom form a wonderful help.